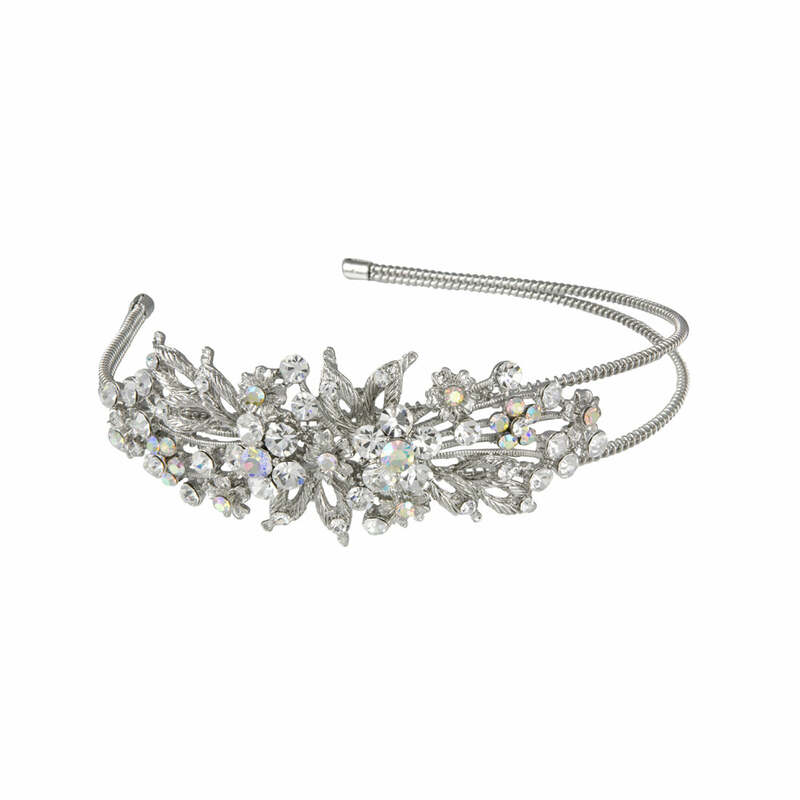 A sparkling vintage inspired floral AB crystal side tiara which combines glamour from the 1920s and 1940s. The sheer beauty of Heirloom of Beauty Side Tiara is just too difficult to put into words. Featuring a double silver tone band and ornate floral design of open leaves and flowers adorned with sparkling clear and AB Austrian crystals, it beautifully combines influences from the 1920's with a hint of 1940's glamour. Perfect for black tie events, proms and special occasions, this is also a divine headpiece to wear to a wedding instead of a hat. 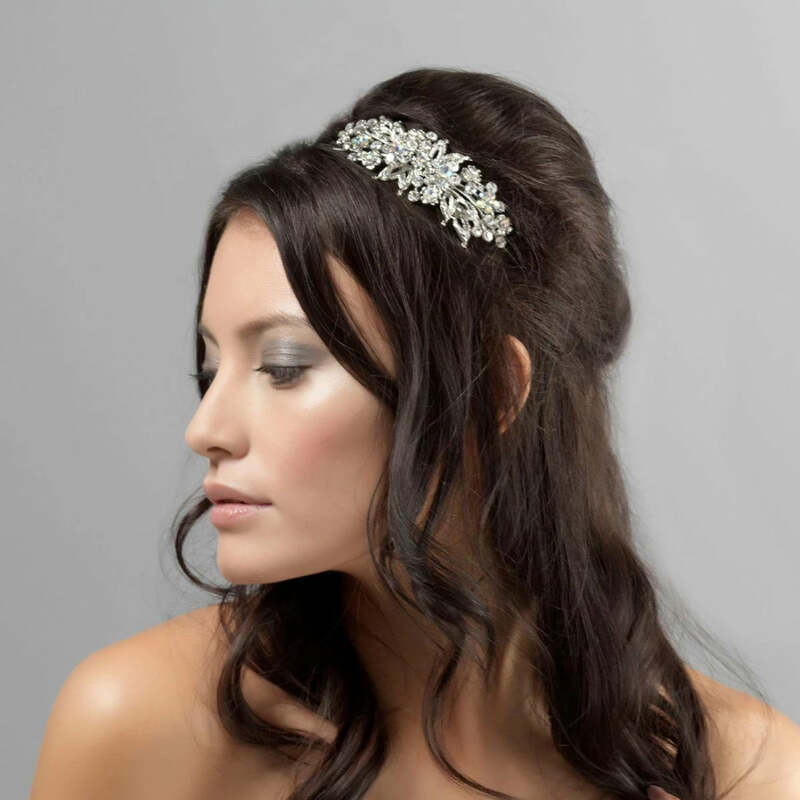 Brides who adore vintage side tiaras are certain to fall in love with this design. Perfect to compliment vintage style wedding gowns, this beautiful piece would also be a fabulous bridesmaids hair accessory. Bought this for my wedding last May as I didnt want a veil, this was perfect. Looks really expensive and didnt move all day. Looked and felt great, everyone commented on how gorgeous it was!! This is a really beautiful tiara! Looks amazing on and made me feel smile, just wearing that alone without even having my hair done yet or my veil on , just makes you picture everything else! Lost for words! I ordered this ready for trying on my wedding dress and I absolutely loved it - everyone remarked on how beautiful it was! I cannot wait to wear it on the big day! I bought this for my wedding and its absolutely gorgeous! I paid for standard delivery and it arrived the next working day! Fantastic service! Thank you! Highest recommendations! I ordered this on Wednesday and it arrived on the Thursday, standard delivery. It is stunning and I can not wait to wear it for my Wedding at the end of Feb!! Beautiful side tiara. Bought this for my wedding next summer and cannot wait to wear it. It is simply beautiful. Great service too. Paid for normal delivery but it arrived the next day n it's 3 days before Christmas too. I wore this stunning side tiara on my wedding day and it was beautiful. It made me feel like a princess and I received lots of lovely comments from people saying they thought it was unusual and apparently it twinkled all day. Recommended girlies! I wore this gorgeous side tiara on my wedding day in September - it's even more sparkly in person than it is in the pictures on the website. The tiara is solid and well made, and I received lots of comments on the day about how beautiful and unique it was! I chose to hide the metal band as it didn't look the best with my style, however this was very easily achieved by covering with hair in my style. Definitely one to recommend to other brides!